Seem all the cool peps are running Applications in containers these days, and considering I haven’t posted in a while - I thought I’d share a working example to quickly create instances of the Cireson Portal for your dev, test environments to help you be one of those cool peps . Publish the different versions to your container repo to give you the ability to freely move the portal around your various environments to automate the deployment, recovery or scaling of the portal quickly. 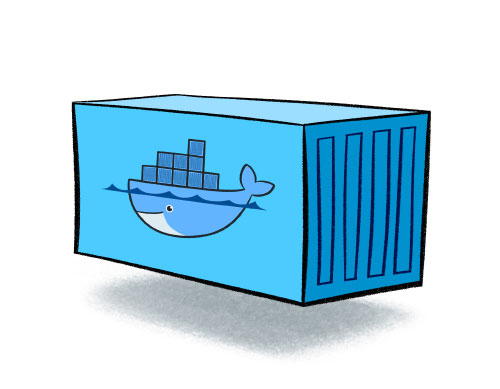 If you not familiar with docker, I’d recommend following the examples on the docker website here. First we need to automate everything the portal needs in order to get built, which we declare in a dockerfile. Luckily the Cireson Portal comes already scripted in PowerShell for all the pre-reqs and install - so the only changes we need to make to the install process is to have the AppPool, CacheBuilder and Platform cache run as LocalSystem so the container can impersonate the gMSA account that has the correct SQL and Service Manager permissions. 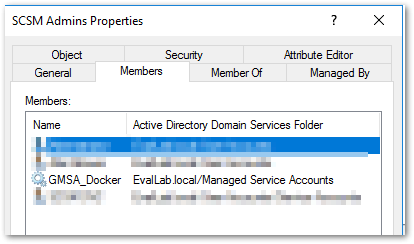 A Local Admin Account that we can set for the parameters installportal.ps1 requires for services. Bring this all together in a dockerfile – too easy right? Will break about the dockerfile with what each step is doing (The complete dockerfile used in this example can be downloaded from the post above and adjusted to suit your environment). By default the escape character in Docker is \ - this becomes a pain when working with Windows containers so is changeable by declaring # escape=` at the beginning. 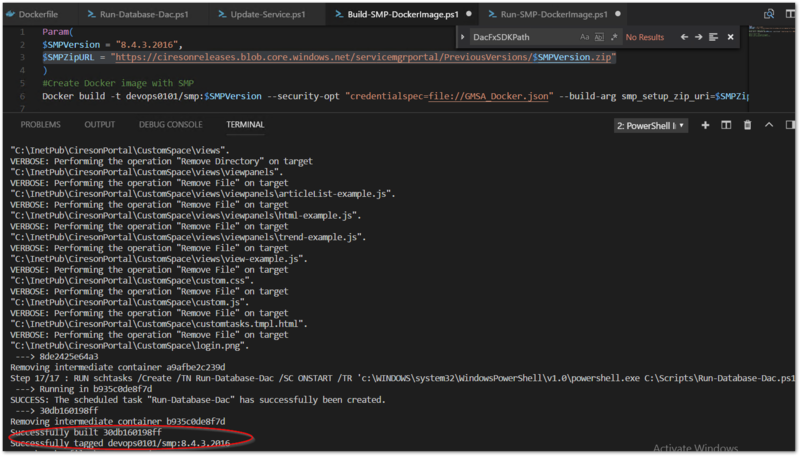 Then we set ARG which are the augments we can use when running a docker build (more on this latter), we are setting a default in case nothing is declared in the docker build command – and then storing them as environment variables that can called in the scripts in the steps latter in the docker file. Next we want create our working folders, download the portal installer ZIP to our image from our Environment Variable we stored above, download our custom scripts, unblock the zip, unzip, run the installpreqs and remove that annoying Default IIS Web Site. RUN((Get-Content "C:\Setup\InstallPortal.ps1")-creplace 'appPool.processModel.identityType = 3','appPool.processModel.identityType = 2') | Set-Content "C:\Setup\InstallPortal.ps1"
The last step is optional but I create a scheduled task to re-run the DAC file on container startup incase the image was pulled from another environment I want to make sure the database gets upgraded correctly. 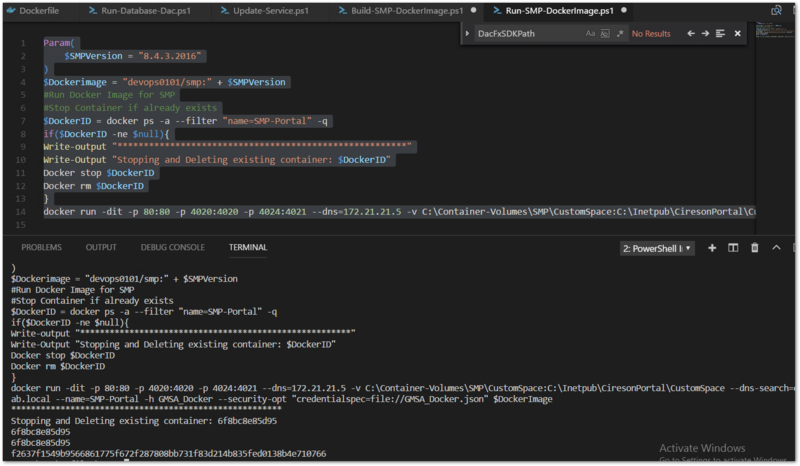 $SMPZipURL = "https://ciresonreleases.blob.core.windows.net/servicemgrportal/PreviousVersions/$SMPVersion.zip" Docker build -t portal:$SMPVersion --security-opt "credentialspec=file://GMSA_Docker.json" --build-arg smp_setup_zip_uri=$SMPZipURL . –name container name – optional but I like to have the container named after the application its running rather than the random names the docker daemon assigns. -h Windows Container Host name – must match the name of the GMSA account its impersonating.